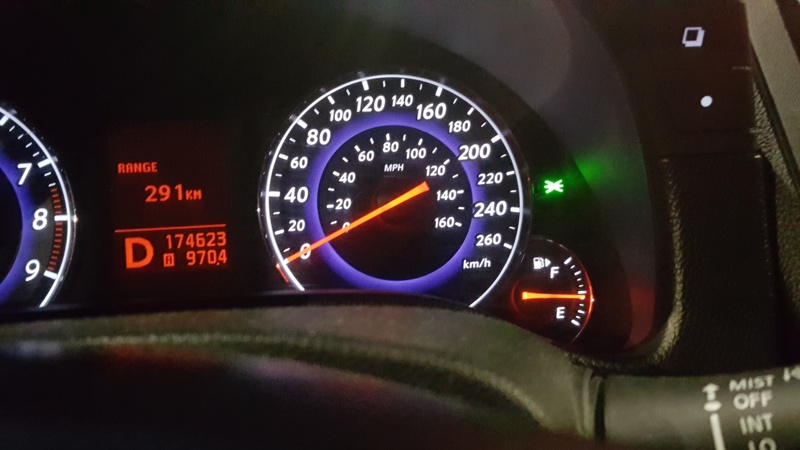 My G37 2010 sedan was giving me bad gauge readings too. 1st I took out and om test/clean the float sensor on the driver's side, then did the same with the passenger side were the second float sensor/fuel pump is. This one gave me an erratic om's reading and noticed the ceramic card type resistor was damaged. So I decided to replace it. The best price I found for a new one was Ebay ($339.37). It arrived very quick and after replaced got the ECU reset by removing the battery. It took a few days for the ECU to learn the new part and driving habits (as I read here). Now the gauge is giving good reading again. Hope this help someone who is looking for a solution. Just to add a couple cents to the conversation here, I picked up a 2009 G37 in April of 2017 with 30k on it. A creampuff!! I drove off the lot with a full tank, and finally had to fill it a week or so later. I purposely waited until the low fuel warning light came on so I could see how many gallons it would take at that point, I figured about 18 or so considering it's a 20-gallon tank and the range was showing about 35 miles left on the remaining fuel so I figured it was pretty low. It took a little over 16 gallons at the first shut-off click of the pump which I thought odd. I shoved maybe another gallon in. I say unusual because in my experience, the low fuel warning comes on with 2-3 gallons left in the tank, not nearly 4. The needle reads above the F when filled, but takes a minute or two to get up there, and I've never driven a car where the needle didn't read above F when filled up. I let it run low and the range reads 30-something miles left (mixed driving conditions, averaging 22-23 mpg per the computer) when the low-fuel warning comes on and the needle is a couple line markings above the E. So I'm thinking the gauge reads higher than actual when it gets down there as I'd expect the needle to be lower with 35 left on the range. I find that odd as most cars read lower than actual down at that level. Of course, that depends on the shape of the tank, the location of the float, the movement of the fuel, etc. I have figured out the float seems to be near the front of the tank. I guess the only way to find the true capacity of the tank/filler tube is to have a gallon of gas handy, run it dry, put the gallon in and then hopefully there's a station close by so you burn as little of that gallon as possible getting there. But I'm not doing that with this car. Welcome to hear feedback if anyone has any input. I bought a fuel pump and a the sending unit from ebay and I'm still having the same issues?? keep a gas tank in your tank, cuz one day I was driving on the highway and when got off of the highway, 5 min after the car died on the road and I had to park it and walk to the gas station. 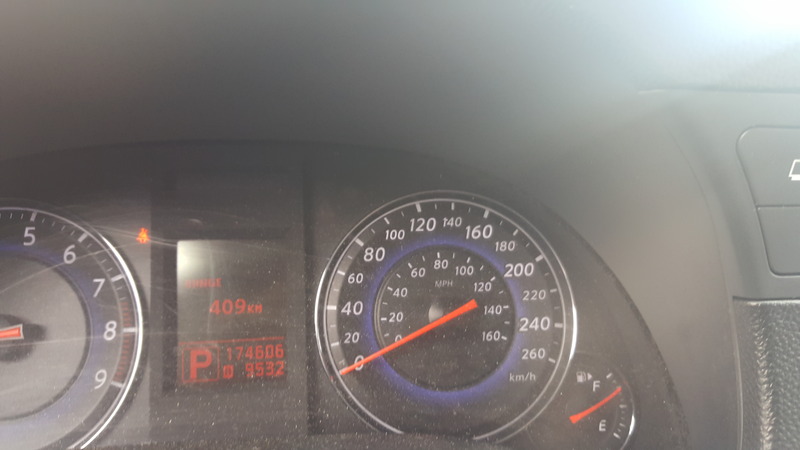 when I looked at the tank it showed I had lots of gas. Did the gauge show you had plenty of gas or the range readout? 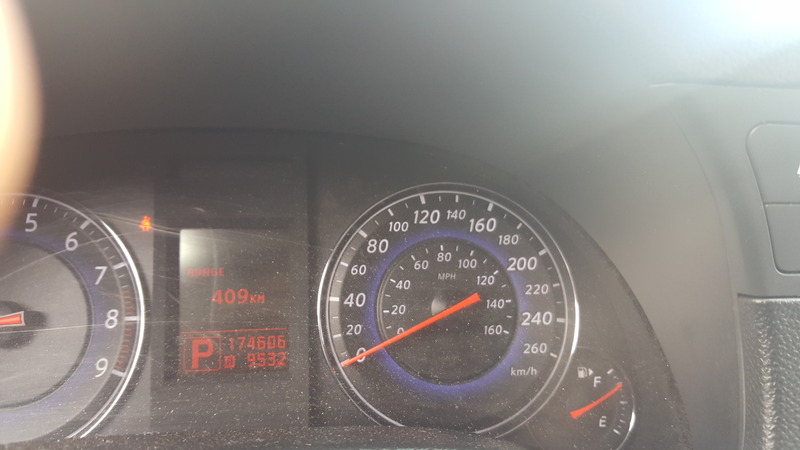 The other day my range said zip while the gauge read a couple tick marks above E. I didn't fill it as I don't drive the car a lot so I put in pretty much $20 at a time. Also, did it start easily and run well after you put gas in? when I go to the gas station and fill it up it will show full, I just bought a fuel pump and sending unit and the car is doing the same thing. my car had died twice on the road this week, on saturday I put $40 and the died right in at work, half the car on the sreet and the other half on the sidewalk lol. I was able to push it in the parking lot at work with the help of a good Samaritan. so if you look at the pic you would see its all weird. Any one of you experience something like that b4 where every time I start the car I hear a big clunking noise and sometime the whole car vibrate when Im at a stop sign. After so many incident where my car stalls (3 so far) I've decided to get a new fuel pump and sending unit since the last 2 that I've bought are giving me the same problem with the fuel gauge. before I do that I was told that I was suppose to reset the ECU is that true?? can someone verify if this one from ebay is compatible and wont give me any problem. Last edited by flipmode007; 07-14-2017 at 05:48 PM. Hi flipmode007, that Delphi pump is a cheaper replacement. The OEM I bought from Ebay is 170401NC0C. It will cost like $60.00 more but it's original. Whatever you buy do the ECU reset. Mine is working fine so far after replaced. I have done the ECU reset and it did not work but I heard that be that the gauge cluster needs to be calibrated. I have tried 3 different sending unit and 2 different fuel pump and same result. lol and now for the past week the gauge is stock at 1/2 tank. To anyone who are having problem with their Unit I came across this video and it does teach us why are sending unit is failing,hope you take a look at it, its really informative. 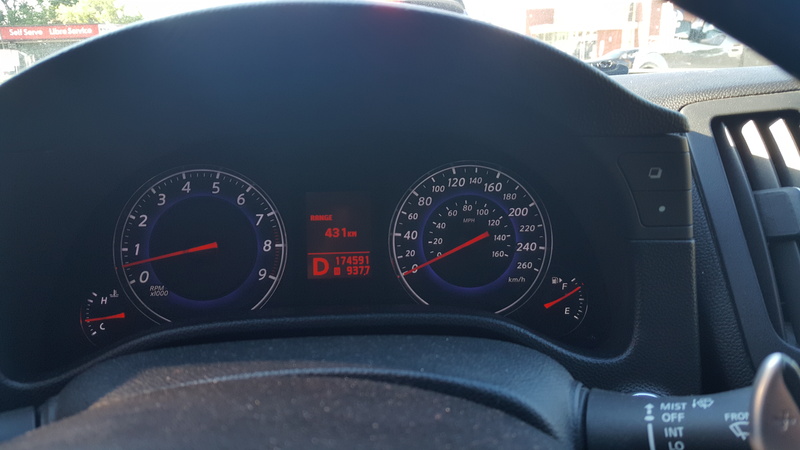 I've had my 2010 G37 for six days. The fuel gauge showed a little over a quarter tank. 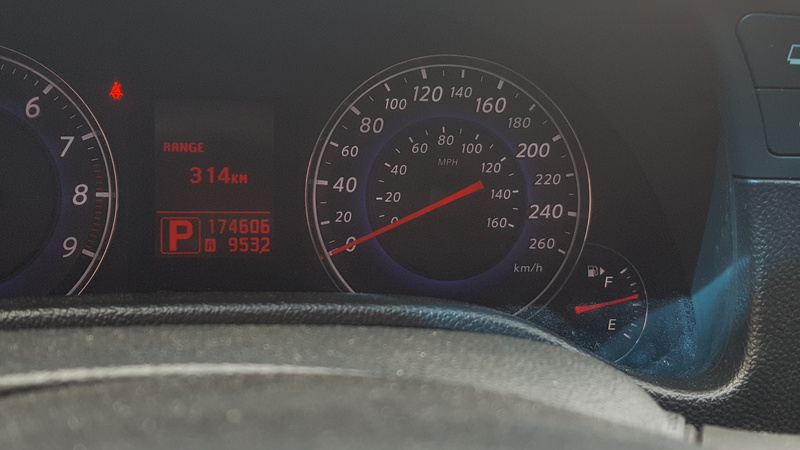 I put about a hundred miles on the car before the computer said I only had 23 miles to empty so I filled the tank. It only took about 7 1/2 gallons and the gauge then showed 1/3 full.. I had the same experience today when I filled the car at almost empty. I am just surprise the gauge and computer are so far off. Did you try to put more fuel in or did the pump/nozzle handle keep clicking off indicating the tank is full? At some pumps you have to pump slower or remove it from the tank and then try again. That has happened to me only a few times with my 2009 coupe, but I was able to get it filling and topped off again. It depends on where you go sometimes. A few times after a fill up, I've let the needle get to the bottom line of the gauge, filled up and it took 18 gallons (the tank is a 20-gallon capacity). That's been pretty consistent. I'll also do the old-fashioned average mpg on the computer vs miles traveled so I know what I've burned, and then do the math to figure how far I can still go and build in a cushion. I let it get below the line the other night and it took I think 18.6 gallons. Yeah, in this day and age, hard to believe Nissan/Infiniti got this wrong. I use Shell premium to keep the system clean.